Who’s the Best Phillies Catcher of All Time? 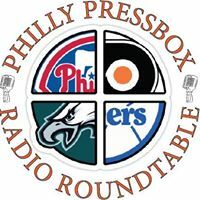 With Spring Training 2014 quickly approaching the boys gathered at the Philly Pressbox for a few cold beverages and some baseball talk. We recently posted a note that it was Mike Lieberthals birthday and received both positive and negative comments about Lieby and him being honored on the Phillies Wall of Fame. That led us to the conversation of Who’s the Best Phillies Catcher of All Time. We quickly decided on the four finalists, Bob Boone, Darren Daulton, Leiberthal and Carlos Ruiz. This pretty much covers the last 40 years of full time Phillies catchers. We’re going to provide some statistical information, as Phillies only, on each of the four and allow you, the fans, to vote on your favorite. The players are listed in alphabetical order. Boonie was the Phillies full-time starting catcher from 1973-1981. He caught 100+ games in 7 seasons. He is 3rd in Batting Average, .259, behind Lieberthal and Ruiz. He is 3rd in Home Runs, 65, behind Lieberthal and Daulton. He ranks 3rd in RBI’s with 456. Boone struck out the least of the four with 365 behind Daulton, Lieberthal and Ruiz. Boone won 1 World Series with the Phils, made 3 All Star Teams and won 2 Gold Gloves. 1978 – Fielding Percentage, 1973 – Assists, 1974- Putouts, 1973 – Runners Caught Stealing, 1974 & 1980 Errors Committed, 1974 & 1980 Stolen Bases Allowed. 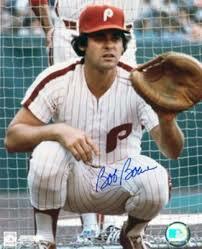 Boone was traded by the Phillies after the 1981 season. He played 9 more seasons, making 1 more all star team and winning 5 more Gold Gloves. He actually played more games after he left the Phils than he did as a Phillie. He was inducted in to the Phillies Wall of Fame in 2005. 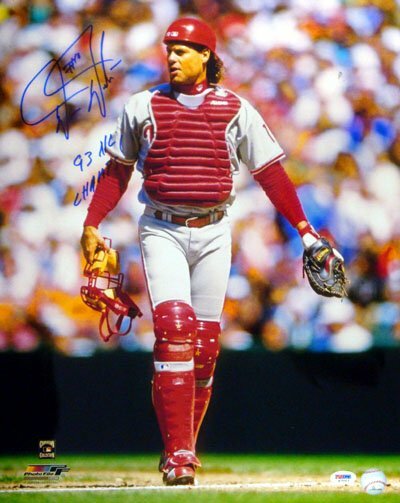 “Dutch” was the Phillies starting catcher for the Phils for the most part from 1985-1995 although he only played more that 100 game 4 times in his career. His best 2 seasons came in 1992 and 1993 when he drove in more than 100 runs in both of those seasons helping lead the Phils to the 1993 World Series. Daulton ranks 3rd in games caught behind Lieberthal and Boone. He ranks 2nd in Home Runs with 134 behind Lieberthal. He ranks 2nd in RBI’s behind Lieberthal with 567. Daulton struck out the most of the four with 709 career k’s. Daulton went to one World Series, 1983, was selected to 3 All Star games and won one Silver Slugger Award. 1990- Assists, 1993 – Putouts, 1990 & 1993 – DP’s by a catcher, 1992- Runners Caught Stealing. Dutch was traded to the Florida Marlins in the middle of the 1997 season, his final one. The Marlins went on to win the World Series. He was inducted in to the Phillies Wall of Fame in 2010. “Lieby” started splitting time behind the plate in 1995 and 96 before becoming the full-time guy in 1997. He caught 100+ games 7 times before his last season with the Phillies in 2006. He is the Phillies all time leader in games caught with 1174 games. 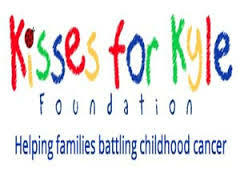 He leads in batting average with a .275 average. He leads in Home Runs with 150. He leads in RBI’s with 609. He is 2nd in strikeouts to Daulton with 560. “Lieby” made 2 All Star teams and won 1 Gold Glove Award. 1999- Assists, 1999- Fielding Percentage, 1997, 99 and 2003 – Passed Balls, 2003 – Stolen Bases Allowed. Lieby spent the final season of his career with the Los Angeles Dodgers. Lieberthal was inducted in to the Phillies Wall of Fame in 2012. “Chooch” took over as the Phillies full time catcher in 2007. He has been a work horse ever since. He’s caught more than 100 games in 6 of his 7 seasons. The only time he didn’t was last season when he caught 92 games after being suspended. He signed a 3-year contract extension this off-season so his stats are a work in progress. 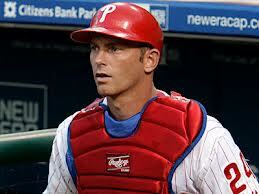 He is last of the four on the Phillies all time leader in games caught with 825 games. He is 2nd in batting average to Lieberthal by .001, with a .274 average. He is last in Home Runs with 57 which is 8 behind Boone. He is last in RBI’s with 336. He is 120 behind Boone for 3rd. He has struck out the 3rd most behind Daulton and Lieberthal with 325. 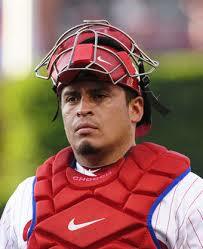 “Chooch” has won 1 World Series in 2008, made it to another in 2009 and made 1 All Star team. He has not won any Gold Gloves or Silver Slugger Awards. Defensively, Chooch has never led the NL in any category. Now you have some numbers to ponder. Now it’s time to cast your vote. The Philadelphia Phillies have received 46 Gold Glove Awards in their history, but I hold the distinction that no one else holds, I won the very first one and it was my only one. Do you know who I am?? In Philadelphia Phillies history the Gold Glove Award has been presented to an outfielder 13 times. Gary Maddox won it 8 of those times. I won it 3 times and two others guys won it once. Do you know who I am? As a bonus, do you know who the other guys are?